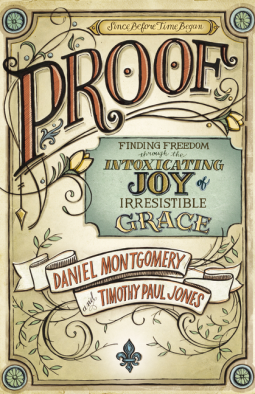 Daniel Montgomery and Timothy Paul Jones have written a book unpacking the doctrines of grace in such a way that the reader will want to drink up and swim in the goodness of Christ. PROOF: Finding Freedom through the Intoxication Joy of Irresistible Grace has been a joy to read and revel in the truth presented. The authors walk the reader through five aspects of the gospel of grace following the Canons of Dort but don’t for a second think that this is a theological tome beyond the grasp of the average reader. Jones and Montgomery have presented thick doctrine with ease, comfortable wit and relevant language. From boozing to zombie analogies, the truth of the grace of Christ will come alive to you in this great book. Planned Grace, Resurrecting Grace, Outrageous Grace, Overcoming Grace, and Forever Grace make up the new acronym I imagine we will see a lot more of in Evangelical circles. But regardless what the acronym is or the savvy language, the gospel truth declared of the pages of PROOF is historic and earth altering. If you have been wrestling with the doctrines of grace or are a card-carrying reformed type, this book is for you. I could not put the book down despite some design features I didn’t like. This book has left me worshipful and grateful for the gift of grace I could never deserve and the security I could never maintain. Get the book for yourself and see how you are encouraged.